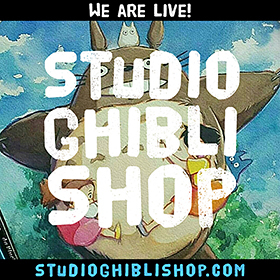 We’ve now made it to Studio Ghibli’s first offical release! It’s taken a while, I’m sorry! Hopefully the other projects I’ve created have kept you entertained up until this point! 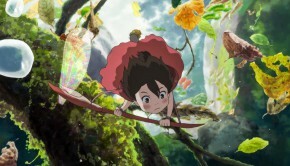 Making a small shift between this film and his last, Laputa marks a demographic change for Miyazaki, whose audience now seems to be a lot younger in age. 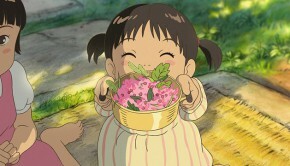 Due to catering differences, on a surface level, some of the techniques Miyazaki utilises makes the film feel less developed as its predecessors (and future works). Though, upon revision, a shift in audience led to more effective methods of storytelling, particularly through a positive use of simplicity. In regards to the story itself, Laputa is a classic good vs evil romp, with emotive, feel good moments sprinkled in-between. Our protagonist, Sheeta, is a young girl who spends the first few minutes of the movie falling through the sky, as she slips of the side of a flying ship in an attempt to escape her captors. 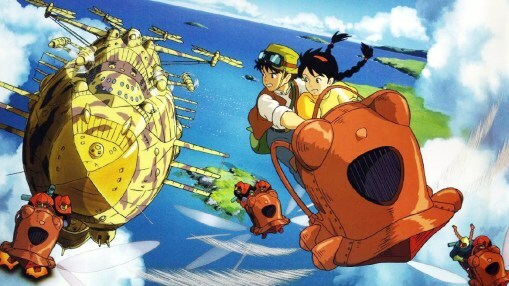 Led by General Muska, the airship transporting the young girl to an unknown location comes under attack from a group of pirates, who also have an interest in the girl. The audience is immediately introduced to Sheeta’s bravery and her ability to stand up to evil, traits that most would ascribe to the classic hero archetype. Before reaching the ground, a magical aura emanating from her necklace prevents Sheeta from smashing into the ground, another important aspect of Laputa’s world that is made apparent to the viewer early on in the film. She floats gently into a mine shaft where young apprentice Pazu is working. The young man takes her home, and soon realises that Sheeta has caught the attention of a pirate gang (for her necklace) and a secret government organisation (for reasons unknown). Coincidentally, Sheeta’s affiliations also spark the interest of Pazu, as his goal in life, to discover the mythical city of Laputa, may be linked to her and her necklace. I enjoyed how the beginning of this film throws the audience into this world. The viewer does not drift lightly from scene to scene. Our introduction to our new environment is through the violent kidnapping, and potential death of a young girl. No clear idea of motives or characters added extra tension to the first fifteen minutes, as the audience was just as ignorant as Sheeta about the dangers around her. 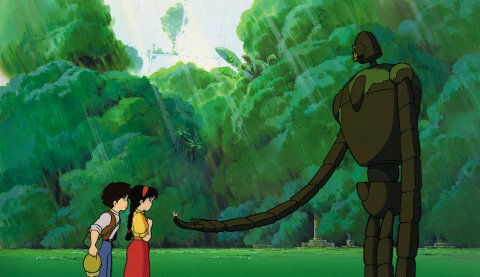 Laputa itself represents Miyazaki’s utopia; a place technologically advanced, yet entwined with nature. 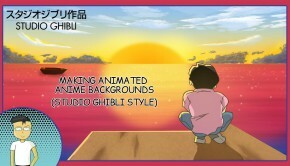 From Gihbli’s first piece it becomes apparent what the director enjoys depicting; planes and the harmonious environments. And he does it so well too! While the animation is still able to portray complex actions, it can done simply and effectively. This mainly works in the films favour, able to prevent jarring the viewer while still being deep and meaningful when it needed to be. The only time its simplicity negatively impacted the piece, I felt, was character design. 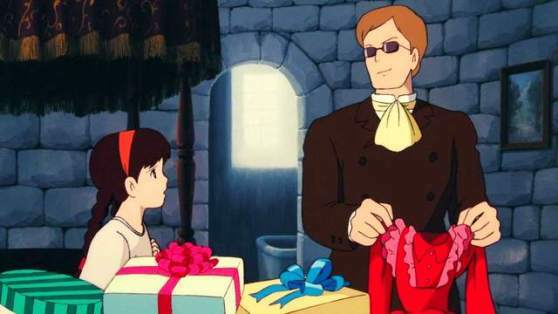 While the characters seem to be accurate in their depiction of whatever group of people Miyazaki attempted to represent, the appearances of some characters were quite bland. Even though background characters have apparel to symbolise the time period of this film, its so simple it comes across as dated. 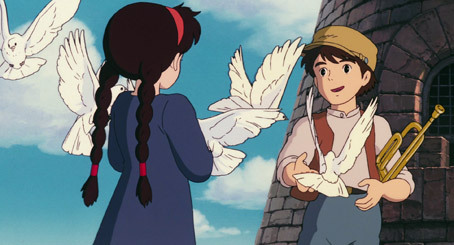 When asking a non-ghibli fan about when she thought this movie was made, she said 1989 based on character look alone! That’s not to say simplicity does’t work, for example “My Neighbour Totoro’s” character designs are simple, and still ambiguous in time period depiction. Now, there’s nothing wrong with identifying that a creation is old, but sometimes the simplicity comes across as a lack of something, as opposed to stylistic choice. Which is a real shame, because the previously mentioned complex animation emphasised anything but that. In saying that, the design of the Robots in this film are iconic, and really emphasise this idea of technology co-existing with the environment in harmony. This is a idea I really resonated with, as the current state of our world would suggest they are complete opposites. After the film finished, I came to a startling revelation; I really, really enjoyed the english voice acting in this film. Sometimes with anime it feels like the english adapters don’t understand the context or character they’re portraying in the film, which leads to either unenthusiastic or weirdly emphasised lines that read as if the actor had never strung together a sentence in their life. It’s been a while since I not only identified compelling anime voice work, but felt as if the actors actually put effort into fleshing out their characters. In particular, the gang members and cast of side characters had genuinely entertaining dialogues, and actual banter in their interactions. 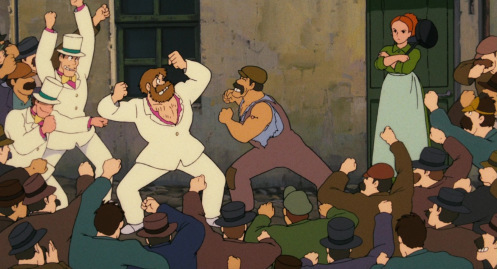 When I first watched the button popping competition between the gang leader and lead miner, I was instantly won over. I felt like I was watching actual people converse, and made dialogue engaging for the viewer, as opposed to a tool for furthering the plot through explanation. A scene in the film that embodies the usage of entertaining dialogue is where Pazu and Sheeta come aboard Captain Dola’s ship in order to find Laputa. The characters circulating the ship are primarily henchmen, and while their personas aren’t necessarily deep, through scenes like the cooking debacle, they show traits that are inherently human. The audience doesn’t need fleshed out characters in order to feel a connection with them. Through witty banter they were individualised, validating their presence in the universe. I didn’t find them excessively chatty, in fact more lines than necessary made it feel less calculated and more human. What was also surprising was that nothing really happens during this part of the movie. We see Pazu and Sheeta deal with menial chores, like cooking and ship maintenance, which broke up the movie nicely. As previously mentioned, meaning doesn’t necessarily come from plot progression. The audience is able to extract meaning from mundane and simpler actions, which in themselves can be very rewarding. Miyazaki must be commended for not only great characterisation, but good pacing. Unlike instances in his previous works, I had more time where I could relax, and didn’t need to intently focus on each scene to keep up with the story. Even though this film had very typical motifs of a children’s animated movie, there were so many moments where I thought “yep, this is why Ghibli are titans of the animation industry”. They don’t just re-use plot points, they actively add substance to them, almost making these motifs more linked to Ghibli films than anything else. For example, the “talking rocks” scene in which Sheeta and Pazu explore the mines turned what would normally be a standard environment and added magic to it, given extra depth to the world and its characters. These subtle additions are what make Miyazaki’s work, in my opinion, the greatest children’s movies of all time; their ability to extract wonder from the real world. You don’t have to live in a fairytale to have fantastical adventures, as we already live in a world full of wonders! I can’t help but smile, thinking about the many children, after watching this movie, viewing their surroundings in a different light. The score of this film is one of the more consistent out of the Ghibli collection. As I previously mentioned in my piece after watching Joe Hisaishi live, music is an essential part of all of Miyazaki’s films, and seems as dense with meaning as the landscapes they connect with. While, at first, I felt as though the music was a lot simpler than his other works, Hisaishi’s tracks still evoked the right emotions within me at the right time, and did so in catchy and harmonious ways. As mentioned in the previous paragraph, the theme of this film seemed to be “wonder”. Every part of this world, no matter how big or small, had a wondrous element to it, meaning the viewer had to double take at even the strands of grass Pazu stood on just in case it sprung to life. These feelings of excitement and exploration are also extracted out of us through the almost mystical tracks woven in these scenes. 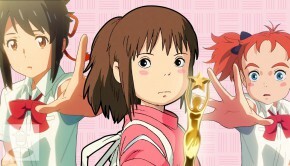 I feel like I’ll be repeated myself throughout every Ghibli review I write, but they put a lot of effort into their music, and 99.99% of the time it pays off. What’s interesting about Laputa is that upon its initial release, the film received almost no western attention. While it played at smaller American film festivals in the late 1980s, it wasn’t available until 2003, after the Disney acquisition. 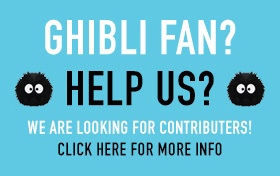 This may be due to Ghibli being a new studio at the time, but its weird to think there was a period of time where Ghibli films were being created to no fanfare. Further, its interesting how foreign Japanese animation was perceived at the time, yet films like Laputa are so inherently western. The concept of Laputa came from Jonathan Swift’s “Gulliver’s Travels”, and certain designs, such as the army and clothing style seem, European in nature. In 1984, before Laputa’s release, Hayao Miyazaki travelled to Wales where he explored a content, but sparse mining village. 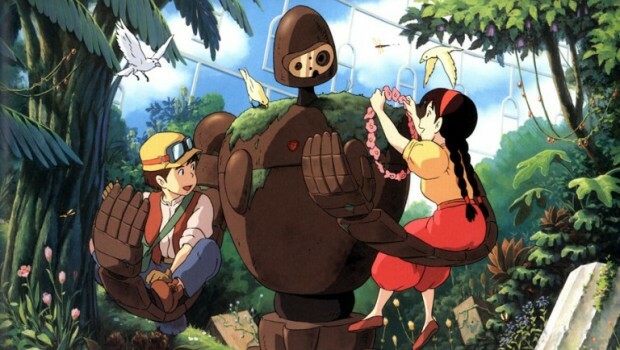 Laputa: Castle in the Sky is an exceptional movie that I found highly enjoyable. While it didn’t challenge the medium plot wise, the english dub’s take on dialogue was a refreshingly human experience, leading to more endearing characters. Again, Miyazaki’s complex and beautiful landscapes seem let down by simpler costume designs, which left fleshed out characters looking generic to the naked eye. An improvement in pacing from Nausicaa also gets a thumbs up from me, making this movie’s world building more immersive and less of a geography lesson. This is one of the most underrated kids films of all time, and I hope it sees a resurgence on the DVD shelf of all family rooms across the world.